Last post (26-May-2013) I wrote about time concerns given progress to date and four projects in this part. The “four projects” bit is somewhat misleading – the course recommendation is to complete just two before attempting the first assignment, completing the others “in your own time”. Given my time situation I have decided to skim through project 2. For the sake of continuity I’ve watched the video and read the textbook chapter, but I won’t be doing additional reading or completing the exercises and research point. 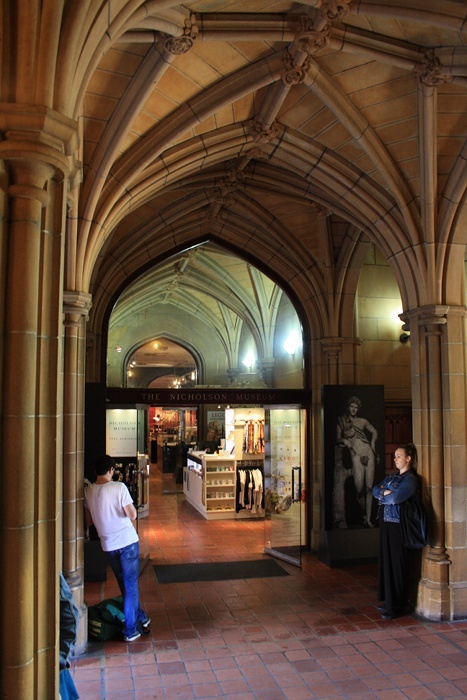 However before moving on from Ancient Greece and Rome I wanted to visit the Nicholson Museum at Sydney University. It holds the largest collection of antiquities in the southern hemisphere, and while there I learnt that the UK has only three collections larger. Somehow I had imagined a dusty forgotten corner, but in fact it is well located on the ground floor of the Main Quadrangle, with good lighting, modern displays and gift shop at the front. It’s also busy – a group of primary school children were enjoying hearing about Egyptian mummies when I arrived and soon after a tour group of adults came through. Later there was a group of university students, plus other individuals like me. It felt fresh, bright and energetic. My only complaint is that I found some of the signage a little too keen to be young and exciting – on the “horrible histories” side, with a somewhat breathless and excited retelling of the “soap opera” (their words) of Clytemnestra and Agamemnon. (yes, I know – it’s important to remain relevant and I’m a grumpy old woman). 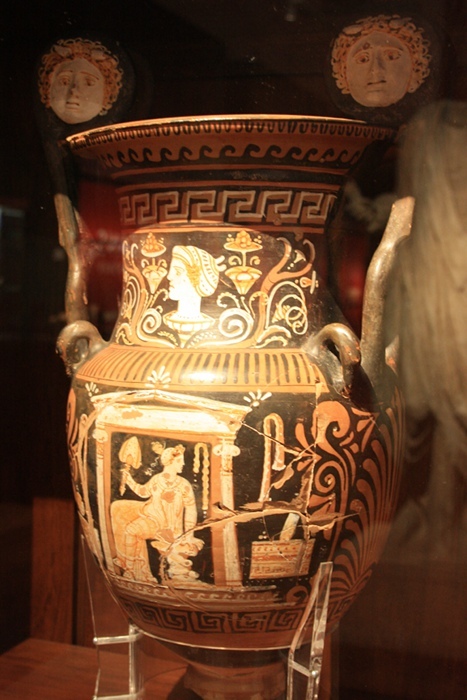 This is an Auplian volute krater, Amphorae Group, 340 – 320 BC. Although a lot smaller it has many similarities to the piece I annotated in project 1 (20-Apr-2013), and it’s great to be able to show a photo instead of my rough sketch. Both are from Apulia around the same time. The shapes and overall layout are very similar, including the swan heads at the shoulder and the moulded heads on the volutes of the handles. 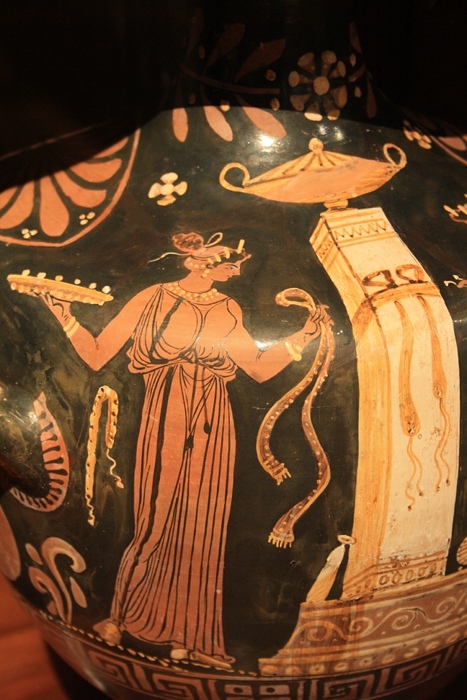 Many elements of the painting are on both vases – the areas of general patterning, the central head surrounded by foliage on the neck (although this one is in profile) and the heroon (central structure) including a slight three-dimensional effect. 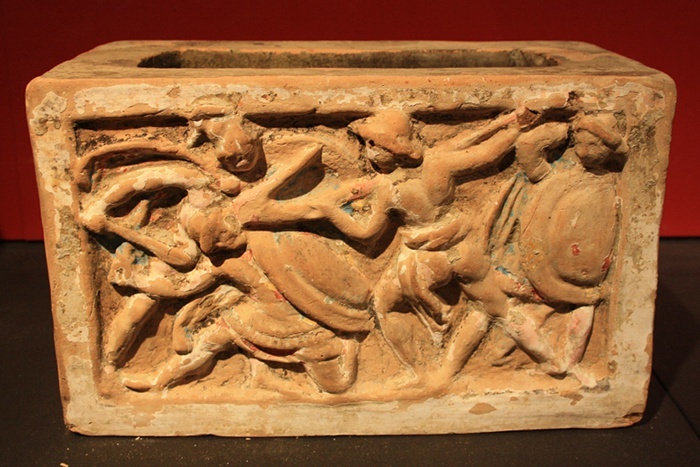 This Etruscan urn, terracotta, 2nd century BC had me breathless because of the colour still visible. A closeup helps! There are quite large flecks of red, blue and yellow. I did a weak attempt at colouration on the Bowmore Artemis (5-May-2013), but although I’ve peered hopefully in the crevices of other works this is the first time I’ve seen the real thing. 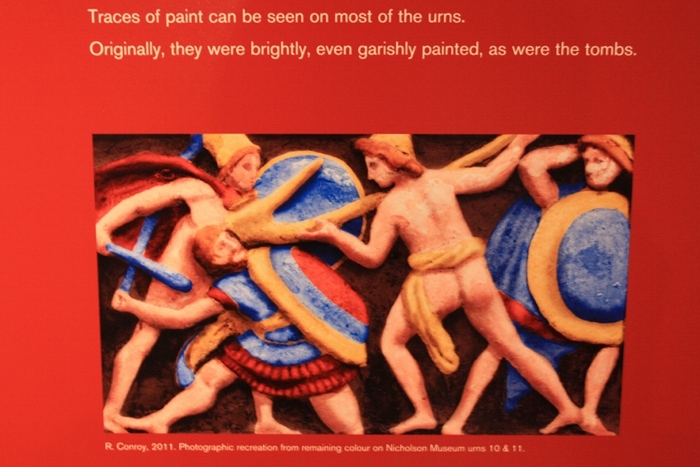 The museum even had a very nice photographic recreation of the colour by R. Conroy (2011). 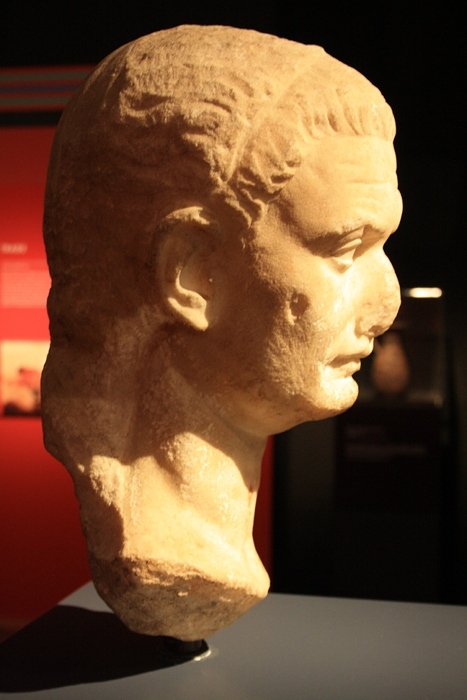 However my main purpose in the visit was to view Roman art, and in particular I was hoping to see a portrait bust – this being a particular Roman invention. Disappointingly there were none on display. Commentary in the museum material, together with fragments I overheard from one of the guides, highlighted the ambiguous situation of viewing such copies, and indeed most of the museum collection, here in Sydney. Nicholson was a major contributor and sponsor of the new Sydney University in the 1850s and in a sense went shopping for antiquities (actual and copies) to “buy in” a culture for the developing colony. There are all the issues of items taken from their own place and context (Elgin marbles anyone? – but even less context here on the other side of the world), and also a hint of aspiring nouveau riche (the goldfields a major source of wealth at the time). On the other hand, I am a beneficiary of the system – so time to get back on topic. 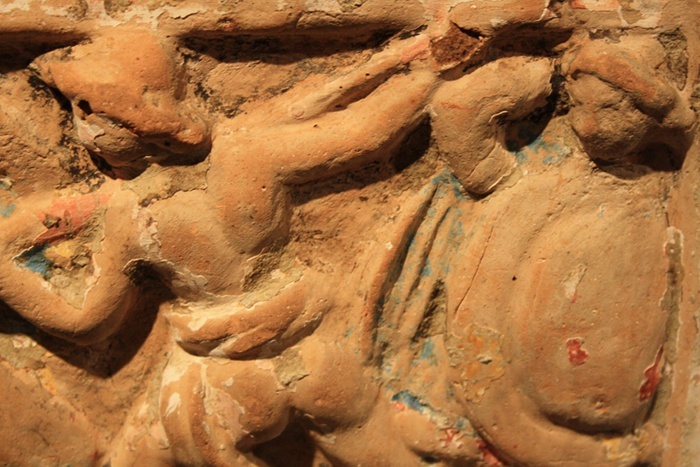 A detail shows some of the propaganda value of the statue – such works were distributed around the Empire and promoted the personification in the Emperor of the might of Rome. 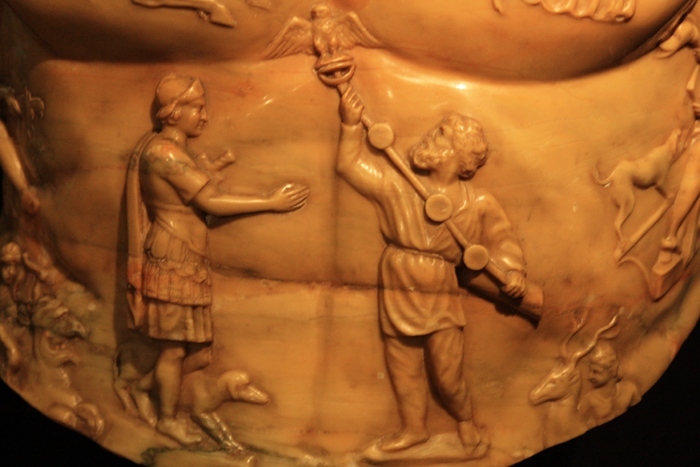 This section celebrates the renewed might of Rome, showing the moment when Roman standards, lost by Crassus in 53 BC, are returned by a bearded Parthian in 20 BC. 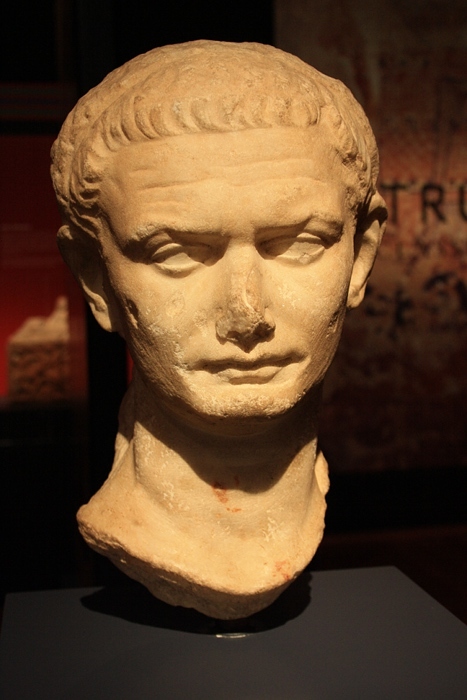 This is Titus, a marble statue head, Roman, first century AD. 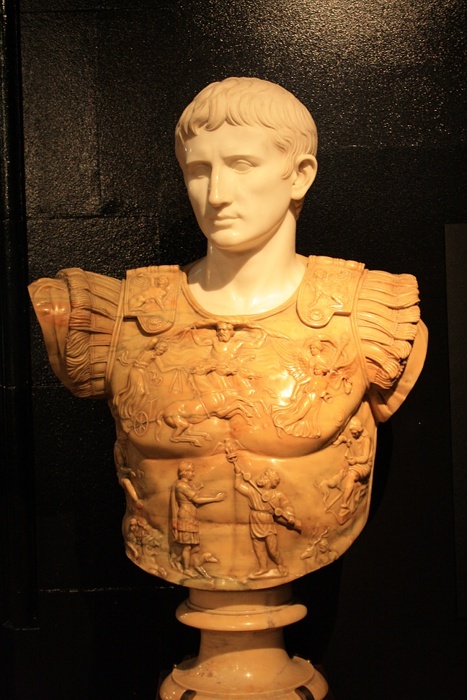 Unlike Greek idealised sculptures, Roman statues (or at least the heads) were more likenesses of individuals. This appears to me an actual man – wrinkles on the brow, a wide firm mouth, a level gaze but a quirk in the eyebrows. Titus is clean shaven and his short hair seems to be held back by a narrow band. The side view shows his slightly fleshy neck. The back is much less detailed, and I wonder if the original statue was intended to be seen from all angles. 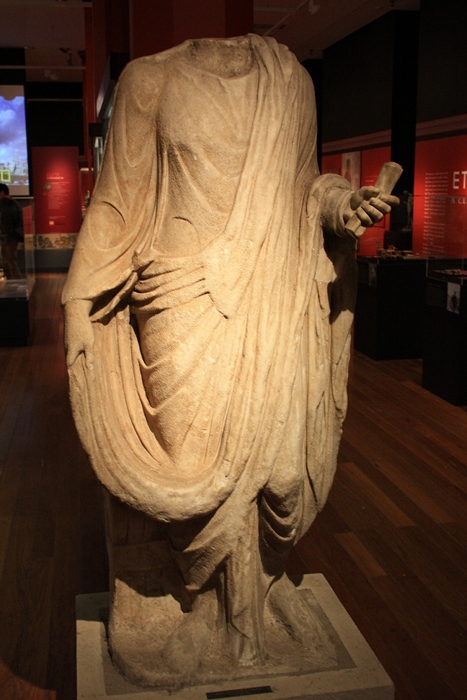 This first century AD marble statue (minus head) of a Togatus was in another part of the room. 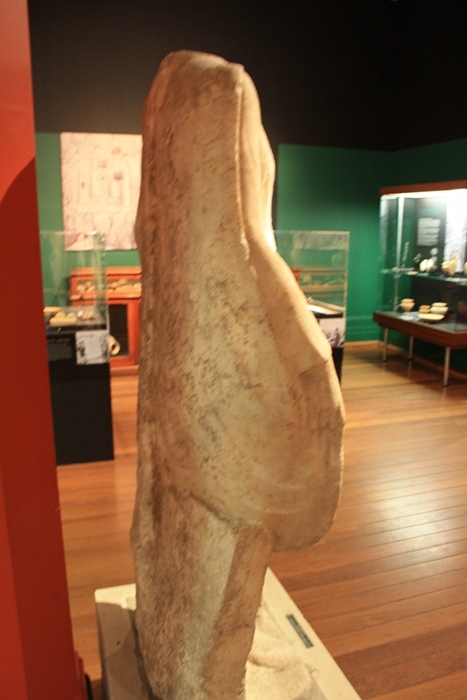 The carving overall seems less detailed than other works, while the sides and particularly the back are very sketchy. 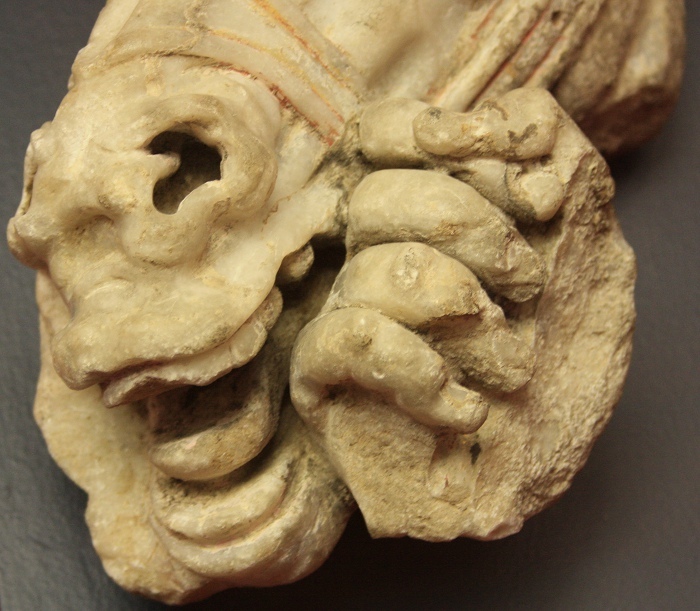 By contrast there was amazing detail in this fragment from the front of a sarcophagus, third century AD. It’s almost like a caricature, with the rolling eye of the horse looking like it could roll right out. 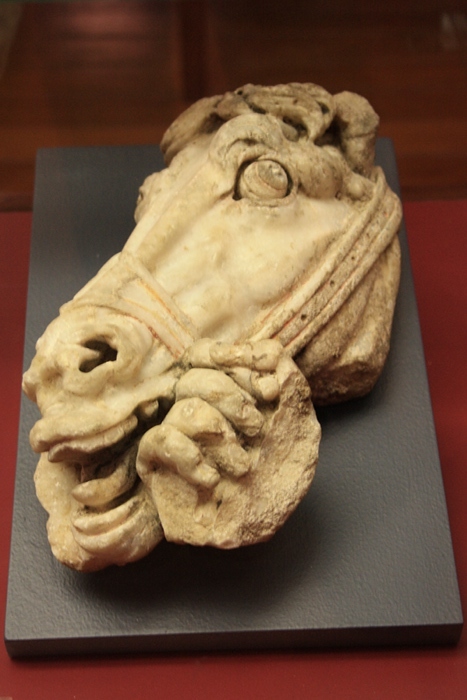 The flaring nostrils are deeply cut and the bend of the thumb shows how strongly the hand grips the bridle. I don’t quite know what to make of the Nicholson Museum. It’s trying to fit so much into a relatively small area – a wide geographical area, broad time period, meeting academic and research requirements as well as making this distant (in time and place) history relevant to all. 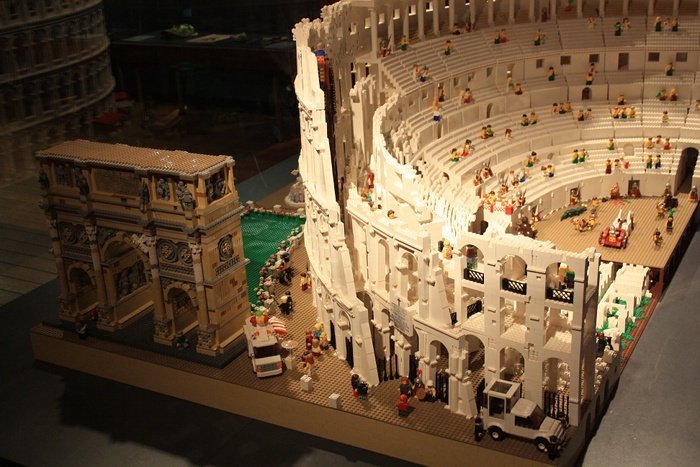 The Lego Colosseum has apparently been a huge success, and will soon be followed by a Lego Acropolis. I suppose the trick is for each visitor to take what is useful to themselves, and be happy that such a resource is available to us all.